Franklin Park Coalition encourages neighbors and members to attend the upcoming meeting organized by the Division of Capital Asset Management (DCAM), feel free to review background information on current advocacy projects in Franklin Park. What: A community meeting for the Shattuck Campus Planning project will be held on Wednesday, September 26, 2018, from 6:30 pm – 8:45 pm at the Golf Clubhouse in Franklin Park. Doors open at 5:45 pm. In 2021, the Commonwealth will relocate Shattuck Hospital services from the Jamaica Plain campus to the Newton Pavilion at the Boston Medical Center campus. 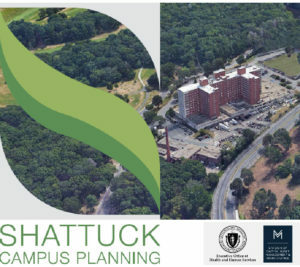 The Executive Office of Health and Human Services and the Division of Capital Asset Management and Maintenance are leading a ten-month planning process, which will end in June 2019 with recommendations for future use of the current Shattuck Campus. A Spanish interpreter will be provided for the meeting. Written materials will be available in English, Spanish or Haitian Creole.